Jump into the classic Power Rangers action when you suit up as the Black Ranger. Think you're up for it? Just consider everything you're going to be getting into. Battling Rita Repulsa and an endless onslaught of Putties. Styling as the ever cool Zack Taylor, the original Black Ranger. And, of course, piloting the Mastodon Dinozord! Now that sounds like a ton of fun to us. Naturally, the first step is going to picking up a prime Black Ranger costume for all the fun. But, don't forget a part of the equation that's of the utmost importance. You're going to need a Power Rangers Helmet! Well, we got your back. Because we're not only the world's foremost online costume retailers, we're also fans ourselves. Which means we got everything covered. And we've got this Adult Black Ranger Helmet that's ready for the fun! 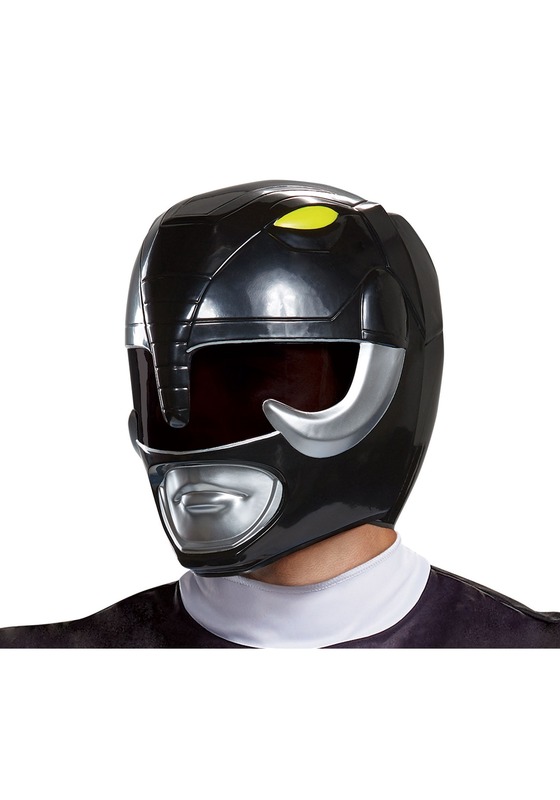 This Adult Black Ranger Helmet is officially licensed from the long-running television series. Made of molded plastic, it features all the signature details from the Black Ranger costume (complete with tusks!) and it comes in two pieces that secure together with hook and loop fastener strips. Sized for adults with one size fits most, this mask features a see-through visor that will partially obstruct vision. We're your top sources for everything costume, so whether you're outfitting your gang for a battle in some Megazords, or if you've got an entire family to shop for, we've got all the top costume choices. Browse our entire selection, and let's get ready for some fun!